Location: Vancouver, Washington, ten minutes north of Portland. Vancouver, Washington, ten minutes north of Portland. Directions: Take I-5 north to the Forth Plain Rd. exit (1D). Go east over the freeway and follow for a short while until you see Vancouver Park on the right. The skate park is on the southeast corner so take a right into the park at 16th. 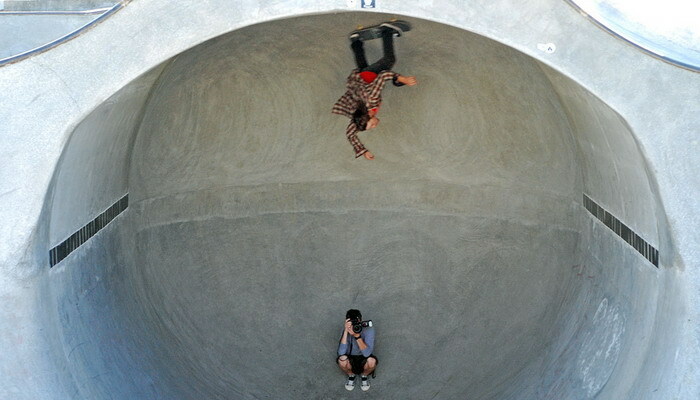 Description: This is also a concrete park. It has two bowls as well as a pyramid and kinked rail. The park flows kind of like a snake course and has a lot of different lines to take. This is also a concrete park. It has two bowls as well as a pyramid and kinked rail. The park flows kind of like a snake course and has a lot of different lines to take. Review: This park can also get busy since it is the only skate park in the Vancouver area. This if a really fun park that is heavily used by skaters of all ages. On a nice sunny day, this is worth the 10-15 minute drive from Portland.